WINSTON-SALEM, NC -- No. 4 Duke hounded Wake Forest's guards, forced turnovers and turned them into easy baskets. With the occasionally maligned defense playing like this, there was no chance of a letdown or a look-ahead. The Blue Devils forced 21 turnovers in Tuesday night's 84-70 victory over the Demon Deacons. By their own high standards, this counts as an off night for an offense that is the nation's second-most efficient in the Pomeroy rankings. And they were outrebounded 37-31 by a Wake Forest team with two 7-footers in the rotation. It didn't really matter with the defense playing like this. "We've still got our defense, we've got our rebounding on some nights and then we also have our offense," guard Grayson Allen said. "So on any given night, everything has to be there. Rebounding and offense wasn't there ... but our defense was, and that's got to be consistent." 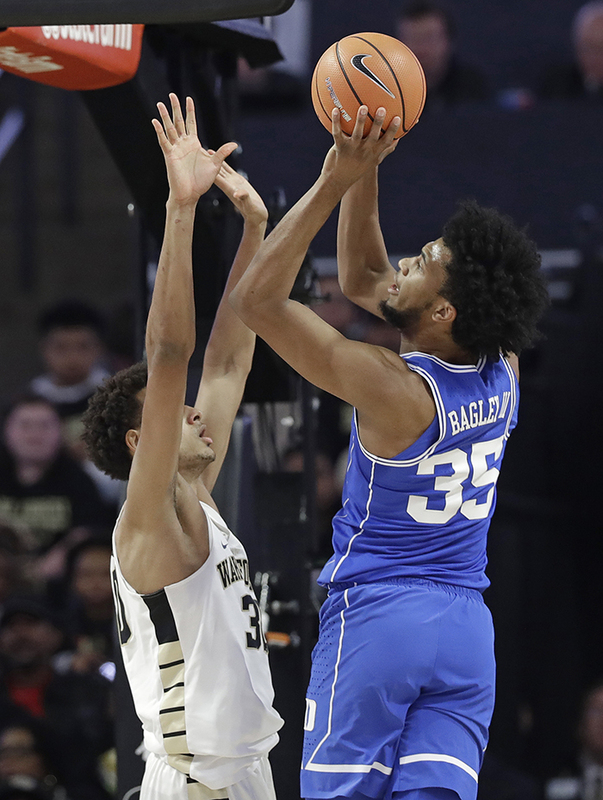 Wendell Carter Jr. had 23 points and 12 rebounds and Marvin Bagley III had 16 points and 11 rebounds for the Blue Devils (18-2, 6-2 Atlantic Coast Conference), who built a 20-point lead with their defense and kept Wake Forest at arm's length the rest of the way. Marvin Bagley Jr had another double-double with 16 points and 11 rebounds. 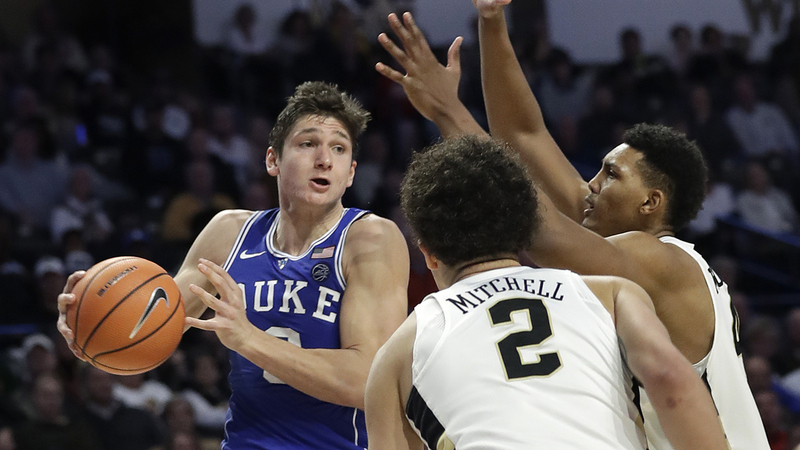 The 21 turnovers forced - 15 in the first half - matched a season high for Duke, which turned them into 34 points while also holding the Demon Deacons to 5-for-20 shooting from 3-point range. Gary Trent Jr. finished with 19 points while Allen had 17 points and six assists - including an alley-oop feed to Bagley for a dunk with 9 minutes left. It pushed the Blue Devils' lead into double figures to stay at 62-52 and started the decisive 15-6 run that restored Duke's comfortable lead. Doral Moore had 18 points and 12 rebounds before fouling out with 2:18 left for Wake Forest (8-12, 1-7), which has lost six in a row and eight of nine. Brandon Childress scored 16 of his 18 points in the second half. "We didn't do ourselves any favors by how we handled the ball in the first half," coach Danny Manning said. "That hole's probably too much to overcome." Duke: This was a classic trap situation but the Blue Devils were never really in danger of getting caught up in it, with that visit from No. 2 Virginia looming on Saturday. Duke usually picks up a couple of league losses on the road each January - the Blue Devils have 11 of them since 2015, including one at North Carolina State earlier this month. No chance of that happening this time, giving them a five-game winning streak that includes easy wins against the ACC's worst teams - Wake Forest and Pittsburgh. Wake Forest: The Demon Deacons have lost two home games to Top 5 opponents in a little over 48 hours, after Virginia earned a 10-point win at Joel Coliseum on Sunday night. This was a largely discouraging step back for Wake Forest with leading scorer Bryant Crawford finishing with 10 points but a season-worst eight turnovers. "I thought he came out and pressed a little bit and made some decisions that we regret and he regrets, too," Manning said. Wake Forest didn't have its top sixth man with guard Keyshawn Woods out with a lingering knee injury. Woods is the team's second-leading scorer, averaging 13.4 points. For Duke, backup big man Marques Bolden (knee sprain) missed his sixth straight game. Duke point guard Trevon Duval had a rough night, missing all eight shots from the field and both of his free throws. "There's just a greater chance of inconsistent performance with young players - or young teams," coach Mike Krzyzewski said. "He didn't play well tonight, but he has played well." Moore finished 9 of 9 for Wake Forest - one basket shy of the school record for field-goal percentage set by Kyle Visser, who was 10 for 10 against James Madison in 2006. Duke: Hosts No. 2 Virginia on Saturday. Wake Forest: Travels to Louisville on Saturday night.